← 100,000 VIEWS!!!!!!! Please take the survey and make the blog better! “I first found out about this wonderful blog when I saw an article in the Worcester News about it last summer. 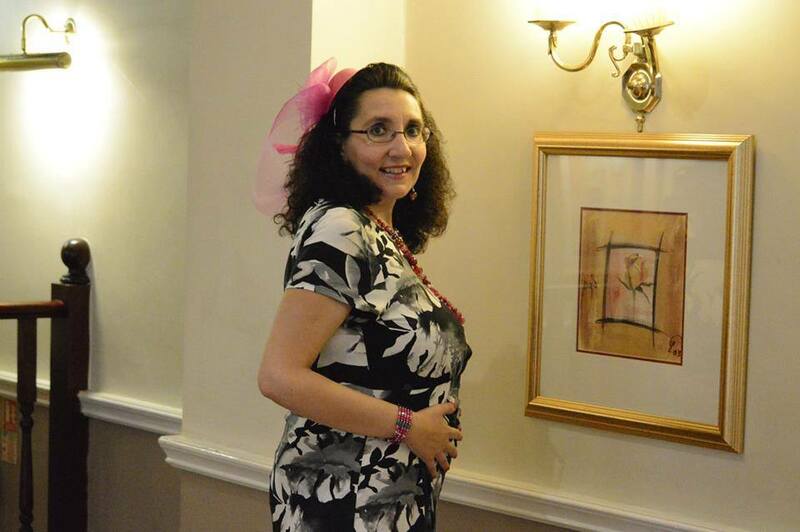 It was very timely for me as I was going to write to the Worcester News to say a huge thank you to Jane Brassington and the staff at the Early Pregnancy Unit at the Worcestershire Royal Hospital for their support and care in the early stages of my pregnancy, after suffering six miscarraiges over the years. I also wrote to David, who featured my email to him and subsequent letter that the Worcester News printed, and spent hours reading all the positive good news stories contained in the blog. All was progressing well with my pregnancy but at 23 weeks my unborn baby boy, who my husband and I named Francesco Enrico, was diagnosed with a unilateral cleft lip and possibly palate. I’d had my 20 week anomaly scan at the Worcestershire Royal Hospital where my husband and I found out I was having a baby boy, and I was asked to return at 23 weeks as the sonographer couldn’t get a good look at his heart and face because his hands were in the way. So it was at that 23 week scan that we were told he would be born with a cleft lip and possibly palate. I was referred for an urgent scan up at Birmingham Women’s Hospital to confirm the diagnosis and was amazed to get an appointment up there literally 3 working days after the cleft lip was first picked up. The scan in Birmingham confirmed the diagnosis – my husband and I were initially devastated. I knew nothing about the condition, and blamed myself for it even though I have never smoked, hardly drank and even gave it up completely before I was pregnant, took folic acid every day without fail along with a pregnancy vitamin and took it as easy as I could during the early days. It was simply put down to “one of those things”. Once I had come to terms with the diagnosis a little more I came across the Cleft Lip And Palate Association (CLAPA) and got in touch with them . They were incredibly supportive and let me ask as many questions as I needed. The more I found out from them, the more reassured I became. I was astonished to find out that 1 in 700 babies in the UK are born with a cleft lip and palate, and there is no known cause as to why. With such a high rate of 1 in 700 babies being diagnosed with a cleft lip and palate, I decided to use my skills to raise as much awareness of the condition as possible and provide a much needed support network to parents locally. CLAPA doesn’t have a branch in Worcestershire/The West Midlands and I have been in touch with them about setting this up. If it can go ahead then I hope it can happen in partnership with Worcestershire Acute NHS Trust and through antenatal clinics, midwives and other support networks such as NCT. I am also in the process of hopefully setting up a Happy Smiles group, also in conjunction with CLAPA. Parents-to- be generally have vaguely heard of the condition but have no idea exactly what it is until they get a diagnosis – I know that my husband and I certainly fall into this category. Coupled with society’s view of perfection and beauty I feel that much needs to be done to raise awareness of cleft lip and palate in Worcestershire and the Midlands. We are fortunate enough to be near one of the best cleft lip and palate teams in the country at Birmingham Women’s and Birmingham Children’s Hospitals, and in the coming months I will be trying to raise as much awareness as possible of the condition through blogging, PR, fundraising, using social media and interacting with parents/children who were born with a cleft lip and palate. In addition, according to statistics from CLAPA that were released at their latest annual conference 60% of parents were unhappy with how their diagnosis was delivered to them. I would like to see some support and additional training for sonographers to help them let parents know about a cleft lip and palate diagnosis in a sensitive and empathetic way. I was so inspired by the Chaplain’s Blog and the great work that David is doing that it encouraged me to start my own to document my journey as a Mum to be of a baby boy with a cleft lip and possibly palate – http://www.babyandcleft.co.uk. Not only will it be a way for me to share what I’m going through and the journey I’m now on with my husband and my unborn baby boy, but I hope it will become a positive blog containing success stories, good news about cleft children who have overcome the condition and an information resource for parents. I look forward to liaising more with Rev David Southall about this condition, and would love to hear from anyone or any parents whose children have been diagnosed with cleft lip/palate and would like to help me with my awareness campaign, or have their success story featured on my blog. I am hugely grateful to Lisa for this story. 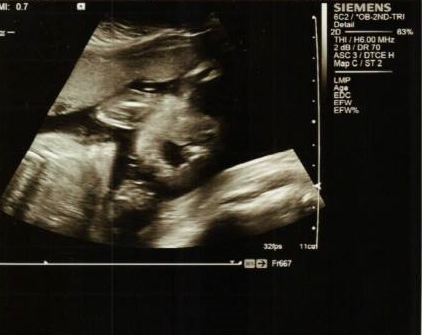 And I feel supremely privileged that she would let us see the scan of her beautiful boy. If you would like your story to feature on the site, or be a Guest Blogger- just post me something via the contact details above. Finally, if you have two minutes to take a quick survey to make this blog better then please visit https://www.surveymonkey.com/s/HXSSGHN. This entry was posted in EPU, Worcester Acute Trust News and tagged Cleft lip and palate, Cleft Lip And Palate Association, Health, make a difference, National Health Service, Pregnancy, Support Groups, Worcester News, Worcestershire Royal Hospital. Bookmark the permalink.